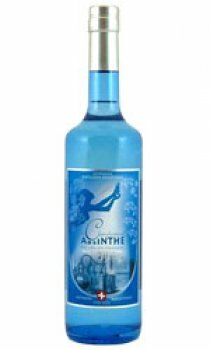 La Clandestine Absinthe is a popular La Bleue (clear) Swiss absinthe brand produced by Artemisia-Bugnon distilleries in Couvet, Val-de-Tavers, Switzerland. It is a highly alcoholic, anise-flavoured, distilled liquor containing the herb wormwood (Artemisia absinthium), and when properly prepared with cold water will louche. La Clandestine Absinthe was launched in 2005 by Artemisia-Bugnon, set up by a hitherto "underground" distiller, Claude-Alain Bugnon. It is based on an authentic 1935 recipe from a Swiss distiller known as Charlotte and has a far higher wormwood content to that of many other Absinthes at 30mg. La Clandestine had been circulating unofficially for several years prior to 2005, but the Swiss legalisation of absinthe on March 1st, 2005, encouraged Bugnon to apply for an official licence and he was one of the first distillers in the historically important Val-de-Travers region to get such a licence. While La Clandestine can be drunk in the traditional manner, adding chilled water poured over a sugar cube, its distiller recommends drinking it without sugar.